The central idea of Ra.One’s story is how a father specially creates a video game to connect to his young son. Perhaps to show how much belief he had in the concept, Shah Rukh Khan actually launched a video game to entice his young audience into watching his latest movie. Looking at the response, the strategy seems to have worked well. 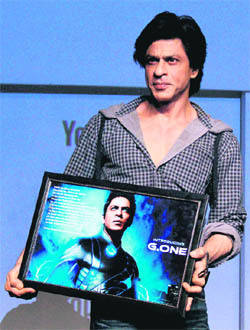 "Ra.One Genesis", the video game, was released across all platforms like the website, iPad, Android, Facebook etc, that, too, free of cost. It is said to have broken records by becoming the most downloaded game and reached the no.1 position on the iTunes store within 24 hours of its release. A special version of the game is also slated to be launched for DTH subscribers. The elusive, shy leopard avoids humans but has a special affinity for dogs. The reason? The dog is an easy prey and the feline relishes its meat. This is the reason why the wildcat is increasingly straying into human habitation. It is enticed by the barking of canines. This was the finding of a year-long study conducted by Himachal Pradesh’s Wildlife Department on a fully grown female leopard that was tracked with the help of a radio collar in a forest near Shimla. Mother’s love or family heirloom, creative outlet or a tool for self-empowerment — these are some of the hues of the creative embroidery of Punjab, phulkari. The main characteristic of phulkari embroidery is the use of darn stitch. The base material for the embroidery is traditionally hand-spun, natural dyed khadi. Imported floss silk yarn from Afganistan or China was used after local dyeing with organic vegetable dyes. It was in September 1936 — 75 years ago — that the first Indian Coffee House, started by the Indian Coffee Board, opened`A0at Churchgate in Mumbai. Since then this institution has had many ups and downs. Much like the coffee houses of Europe, Indian Coffee House quickly became a rendezvous for the intellectual and the dilettante alike. The annual Bekescsaba Festival is the place to taste and find out secrets of Hungary’s spicy kolbasz sausages, but strict vegetarians and a few others might want to steer clear. From butchering a pig, complete with blowtorch for searing the bristles, to grinding the meat, mixing it with spices and squeezing it into long, filmy sausage casings that fit just so over the nozzle of a purpose-built stuffing machine, pig to plate is on display with little left to the imagination. When guns become roses, it makes music. Colombian rock musician Cesar Lopez, who is in the country to perform at the ongoing Delhi International Arts Festival, sings songs of peace with his gun-guitar — an AK-47 modified into a six-string electric guitar to symbolise the healing power of music. A pair of ample bloomers, once worn by Queen Victoria of Britain, have sold for under £ 10,000 at an auction in Edinburgh. An anonymous buyer purchased the white silk undergarments that went for £ 9,375, including a buyer’s premium of 25 per cent. The bloomers were expected to fetch £ 3,000, the reserve price put on them by auction house Lyon & Turnbull. Songs and dance numbers are an integral part of Hindi commercial cinema. In this scenario, the actor singing his own lines proves to be a bonanza for his fans. The of actors today are just not content with running around trees or flexing their muscles and driving the villains away. They want their share in the musical potpourri as well. Tell us something about Don 2. I really don’t know what to say about the film as that way I will be giving out the whole story. It has been fun, challenging yet satisfying journey so far to make this movie. I was guilty of saying that I won’t probably make a sequel of Don, but my obsession with the character got the better of me. With amazing help and support and almost a sharing of vision with Ritesh (Sidhwani, producer) and Shah Rukh and rest of the team, I could not help but make Don 2. Haus Publishing, London. Pages170. £9.99. By Daya Ram Varma, MD, PhD. Prakash Books. Pages 159. Rs 125. Routledge. Pages 501. Rs 995. Dya Singh, Australia-based musician, calls himself "the musical interpreter of the traditional Sikh hymns (shabad), with diverse influences from around the globe." In Ludhiana on a recent visit, he talked about the start and spread of his musical journey. Gimmickry and eyeball grabbing innovations may have become a norm in the classical tradition; however, eminent kathak dancer Rajendra Gangani steadfastly refuses to be swept away by the prevailing trends. Purity and originality remain the hallmark of his dance and he continues to swear by tradition. He muses, "Indian classical forms have survived centuries precisely because of its original flavour and beauty. So, there is no way you can trifle with its original code." Barack Obama is America's "truly hybrid" President who represents many continents, races, cultures and histories, his first Indian-American biographer has said. Dinesh Sharma's book is the first full-length book on a sitting President and examines how Obama's early years influenced him.